I have been criticized by a couple of people recently for dwelling on the negative side of life and the potential for world-ending, violent scenarios. So let me tell you in all candor that I would prefer not to do so, I really would, however when recent headlines announce that Israel is deploying three nuclear-missile-firing submarines off the coast of Iran, what do you think that means? What are those submarines and missiles designed to do? Why are they being deployed off the coast of Iran? And when the Russian news services just last month reported on large-scale military "exercises (that) simulated dealing a massive retaliatory nuclear strike in response to an enemy attack" what do you think that means? Oh yeah, the military exercises featured practice firings of three nuclear missiles. In the event of a real, shooting, nuclear war you will have 20 minutes of warning. Or maybe you will simply have your eyes melted out of their sockets like so much candle wax -- without warning. And your skin will drip off your body like a barbecued chicken. It will all happen in a flash. Because the nuclear flash will flash microwave you on the hoof. Your tax dollars hard at work, keeping you free and "safe" from terrorism. This is not idle speculation. You can see the preparations for nuclear war right in front of your face. Just four days after the Russian nuclear war drills (see link above), the USSA staged its own massive nuclear war game, called "Exercise Global Lightning". What sort of Global Lightning? Why, global nuclear lightning, that's what kind, with a dazzling atomic flash that will melt your eyes right out of their sockets like so much candle wax. And make your skin drip off your body like a barbecued chicken. The prospect is horrific, and yet the obvious preparations for nuclear war are right there in the headlines in recent days and weeks. Have no illusions, a shooting nuclear war would/will be ghastly beyond belief. Here's a succinct résumé of the lethality of nuclear war. Please click the link and read it. As the linked article explains, things can quickly and easily escalate from the merely unimaginably horrific, all the way to the physical obliteration of billions of humans and many other higher life forms on this planet. Life forms like trees, ducks, cows, horses, rabbits, deer, wild flowers, roses, lilies, etc. Gone in blinding flashes and towering, billowing, mushroom clouds of highly radioactive dust that alter the Earth forever. I am reminded of the dark, possible future scenario that the shamanic plants called to my attention in my Amazonian shamanic excursions of mid-to-late 2012. The scenario that I was inwardly warned of is that there is a very malevolent and highly stealthy power faction on this planet who want to initiate "totalitarian nuclear warfare". They contemplate achieving their objective by staging surprise, "false flag" atomic or nuclear attacks in cities in the USSA. Several different cities were called to my attention as their desired targets. As I understood it, they intend to use low yield devices, smaller than the bombs that the USSA dropped on Japan in 1945. Maybe in the two to ten kiloton range, enough to destroy the central business district of a city and kill a few tens of thousands of people outright. That is the plan, as I understood it. This group is not who you would/will be told it is, if their plan is actually carried out. They are loathsome and vile, without any redeeming qualities whatsoever. An aggressively vicious, venomous serpent has better moral character than they do. As I understand it, these sorts of events do not have to occur. The future is malleable. We can avoid nuclear war. It all depends on our individual and group decisions. We have to act decisively, individually and collectively, to avoid that scenario. And yet we are sliding toward nuclear war. You can see the preparations for massive nuclear war. The nuclear war exercises are announced publicly, in the daily news cycle. The USSA military recently staged an exercise in which an adversary force tried to seize a nuclear weapon from a secure military site. Guess what? The USSA military failed to recapture the seized nuclear weapon in the test attack. I must say that the outcome of the test is absolutely not a surprise for me, because I have seen firsthand that the USSA military really does not have very secure control of its nuclear arsenal. In my repeated, nonviolent forays onto the launch lids of nuclear missile silos to peacefully demonstrate against nuclear war, I have been able to witness in person the USSA Air Force's emergency response to unexpected visitors (like me) to their nuclear missile silos. I want to tell you that they have been very lucky so far. My intent was never, and is not now, to cause a violent incident with respect to nuclear missiles. On the contrary. But others may not be so well-intentioned. And most alarmingly (see above), when the USSA military ran a test exercise, their team lost control of the nuclear missile silo. The USSA military's nuclear policy is, thus, reminiscent of that of a nuclear-armed, Keystone Cops global police force. It doesn't inspire much confidence. As many of my readers know, I have again and again, nonviolently demonstrated against preparations for nuclear war by the USSA military. I am one of the comparatively few individuals who have troubled themselves to go right out to the nuclear missile silos and over the security fence onto the launch lid to peacefully protest. 99.9% (or more) of the human race have not bothered themselves to do that. However, it's a firm guarantee that feigned ignorance of the deadly nuclear Hydra will offer an individual zero protection if it comes to nuclear war. By then it will be far too late to voice any objections, or to remonstrate, "If only I had known, I would have done something, I would have said something." Well, consider that now you do know. The world's nuclear powers are posturing for nuclear war and you are being duly informed of that reality right now. Your home planet, all of it, and your very existence are under threat. I went to the sprawling, nuclear missile field at Minot Air Force Base in North Dakota, USSA and demonstrated peacefully on a nuclear missile silo near Parshall, North Dakota on the morning of 15 April 2010. I issued my Minot Manifesto to the press on that occasion. It's one of the most important documents I have ever written, and yet, it remains one of the least read. Towards the end I explain the reasons for and symbolism of my distinctive dress and accoutrements. I took it all with me. 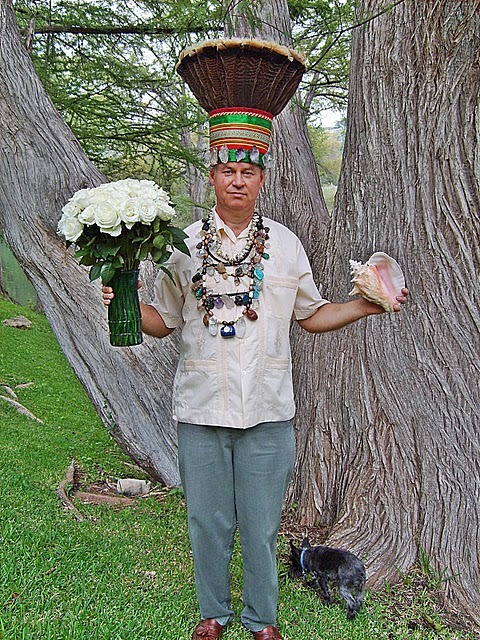 I went over the security fence with the feather and crystal headdress, the crystal necklaces, and a bag full of conch shells, crystals and other objects which I left on the silo launch lid. The vase of three dozen white roses I left just outside the fence. The preparation for the demonstration was a long time in incubation. I spent months accumulating the feathers, crystals and ribbons for the headdress. I traveled widely, personally collecting or purchasing crystals for the necklaces that I made. I made multiple visits to Enchanted Rock in the Texas Hill Country, revered for centuries by Native Americans for its special spiritual presence and power. I climbed to the top, all 400+ feet, and stood barefoot on that huge, granite outcropping that wells up from the bedrock that lies deep beneath the North American Continent. I faced the north, toward North Dakota, and expressed my intent to the continent itself and asked its blessing. I spoke to the Nature spirits that were there and asked them to go with me on my journey. I could feel their presence; it was palpable. I had a strong sense of connection with the massively alive and conscious, spiritual essence of the continent itself. I also paid multiple visits to the Toltec Mounds in central Arkansas, to ask the blessing of the spirits of the ancient shamans and ancestors who reside there. The first time I went, Walela's flesh-tingling, Cherokee rendering of Amazing Grace was playing in the visitor's center. I went out directly and crossed the field to visit with the tree right in the middle of this photo. As I say, I went to the Toltec Mounds more than once, and as at Enchanted Rock in central Texas, the silent solitude of the place is very conducive to forging a deep connection with the land and the resident spirits, if that is what you want. It was my impression that the spirits were curious, and a bit surprised, since almost no one bothers to communicate with them and ask their blessing, especially on such a cold and blustery day as the first time I visited, with a bitterly icy wind cutting in off of Mound Lake. Understand that when I talk about the spirits here I am not talking about the nonsense that passes for "spirituality" in so many Christian churches, Jewish synagogues, Muslim mosques and Hindu temples. Nor am I referring in any way to their so-called religious "morality". I am rather talking about conscious communication with the multidimensional, conscious Nature spirits who inhabit the hyper-aware, living landscape, an altogether different thing. For some reason, on most of the occasions that I visited both Enchanted Rock and the Toltec Mounds there were very few people there. Both places were usually almost deserted, which was to my liking, given that I came to consult with the resident natural spirits of those hallowed precincts. We have to reestablish conscious communication with the Earth itself. How many rounds of ammo you may have are simply not relevant, or how much food you have stored, if the Earth itself dies. And right now, the Earth is dying, it is reeling, it is under heavy assault. Let us count the ways: fracking, deforestation, Fukushima's radioactive murder of the Pacific Ocean, genetic modification of the DNA of evermore species of life, global chemical contamination of the environment, chemtrails, nanotechnology, global predatory economics, obvious preparation for possible extinction level, nuclear warfare, overfishing of the seas and oceans, the ongoing death of the Gulf of Mexico due to British Petroleum's savage crimes against man and Nature, the destruction of the Amazon. And that is just a very partial list off the top of my head. You will not fix that with an assault rifle. None of it. Only a profound change in the state of consciousness of our species will resolve these issues. If we refuse to change, if we elect to continue much farther down the destructive, ignorant path we are on now, then it will soon be over for this installment of terrestrial humanity, because we are on a collision course with catastrophe on a radioactive Hell planet that we ourselves have created. What's that you say? Not you? Well, sir, well, ma'am, have you ever voted in the elections that bring to power the members of parliament or Congress and heads of state that put into play or in some wise enable or facilitate the destructive policies I have set out above? Have you sent in a check or otherwise subsidized with your tax money the policies of the various governments of this planet? You know, the ones that send out the USSA Marine Corps, or the French Foreign Legion, or the Royal Air Force, or the NATO armies and naval fleets, to slaughter, pillage, plunder and bomb and invade and conquer? Have you done that? Perhaps you will say that you have no choice, that your paying to have strangers to kill yet other strangers in other countries on your anonymous behalf is the price you pay to live a (so-called) "free" and "comfortable" life. For whatever reason I tumbled to the hidden reality of the numerous underground and underwater bases and tunnels in the late-1980s to early-1990s and ended up writing a series of three paperback books about some of my discoveries. These installations can be literally anywhere -- beneath the sea, beneath the mountains or a desert, swamp or large city. And they can be very deep, thousands of feet down, a mile or more, as well as impressively large and technologically sophisticated. I still remember when I was beginning my research. I couldn't believe the sorts of documents that I found in the open literature, including the material from the US National Committee on Tunneling Technology for making tunnels hundreds of miles long, and the plans for the Subterrene, the nuclear powered tunnel boring machine that was in R&D at Los Alamos National Laboratory, designed to melt its way through solid rock, like a hot knife through butter, and much more. There were even references to a Subselene, intended to melt tunnels on the Moon. It was then, and remains still, very strange. All sorts of people, from all walks of life, began funneling bits and pieces of information to me. It is a fact that this "hidden" underground and undersea reality is so extensive that it simply cannot be kept totally secret. It turned out that one of my friends (now deceased) was taken by the Secret Service deep underground beneath the White House in Washington, D.C. This was back during the Lyndon B. Johnson administration, in the 1960s, when she was working for the Department of Housing and Urban Development in an entry level position. She never understood why the incident occurred, and the Secret Service offered no explanation. They simply showed up at her desk one day, escorted her across town to the White House, ushered her into an elevator and took her down 17 levels underground into a secret network of hallways, corridors and offices to deliver some papers she had been given by the Secret Service. She went to her grave without knowing the who, what and why of that incident. It is very puzzling, but then I have run across a whole slew of puzzling stories when researching and writing about the mysterious deep underground and undersea bases and tunnels. Something highly strange is going on and we have not been told even a tenth of one percent about it. One of the things that became clear to me is that the entrances to these subterranean and sub-sea facilities can be literally anywhere -- on a secure military base, beneath an office building or government building, university, church, or school, beneath a dilapidated farm building or farm silo, inside a house or ordinary looking outbuilding, warehouse or factory. At a rock quarry or heavy construction site, inside a road, subway or railway tunnel. Or maybe a doorway set in a cliff face on a mountainside or inside a storm sewer, strip mine, deep mine or hydroelectric dam. It is all cleverly hidden all around us. We are living in bizarro world. I continued my research in Underwater and Underground Bases. I kept finding more material, so I kept going. It became clear to me, as I came across more material, that the USSA military and others have also been busy undersea. Already, as of the mid-1960s (if not before), the technology, expertise and funding was available to make large, undersea bases, hundreds of miles out to sea, in mid-ocean. The offshore, continental shelves are an even easier area to tunnel out and construct undersea bases. The documentation and illustrations that I obtained clearly mentioned berthing large, military submarines and their crews in sub-sea bases tunneled out of the seafloor. The USSA Navy documents referred to this as the Rock Site plan. Based on what I have been told by a number of different people, something like this has been done, but under a different name that remains unknown to me, as of this writing. The important thing to understand is that this project of underground and underwater base and tunnel construction, that is ongoing to the present day, has a long genesis, going back at least to the Third Reich, in its present manifestation. As I continued my research I ran across some old Project Paperclip memos from 1947 that explicitly mentioned bringing Xaver Dorsch and some other Nazi underground base experts to the USSA, to work on the USSA military's so-called "underground plant program". I reproduce these memoranda in my book, Hidden in Plain Sight: Beyond the X-Files. Xaver Dorsch, of course, was the head of the Todt Organization, from 1942 to the end of WW-II. The Todt Organization was a civil engineering agency that was analogous in the Nazi military system to the US Army Corps of Engineers and the US Navy Seabees, in the American military system, albeit that the Todt Organization was not itself a military agency. Fritz Todt, the father of the world famous German Autobahn system, was the head of the organization, up until his death in an airplane crash in 1942, whereupon effective control became consolidated in Xaver Dorsch's hands. Dorsch initially reported to Albert Speer, but in 1944 Adolf Hitler ordered Dorsch to report directly to him. At war's end Xaver Dorsch was probably the preeminent expert in the world on the construction of large, elaborate, underground bases and tunnel systems. The Nazis were far ahead of the Americans in that field, as in aviation, rocketry, chemical engineering and other fields. Dorsch was in USSA military custody for a period of years after war's end. I obtained a couple of the documents he wrote during his debriefing by the USSA Army. In any event, the documentary trail I found indicates that part of Project Paperclip was definitely concerned with underground base construction. Public remarks in 1987 by Lloyd Duscha, then Deputy Director of Engineering and Construction for the U.S. Army Corps of Engineers, make clear that the USSA program of underground base construction was given its impetus by the Nazi program. This is an explicit corroboration of the plain evidence in the 1947 Project Paperclip memoranda. One of the other things that became real clear to me as I further pursued my research and writing was that the most serious action in Washington, DC takes place underground, in some cases, extremely deep underground. I ran across documentation from the last days of the JFK administration, in early November 1963, for a planned, very deep, manned command center far beneath Washington, DC, from which to wage and survive nuclear war. The plans mentioned a depth of 3,500 feet, with secure access from the White House, State Department and Pentagon, by multiple, deep elevators and underground trains. The facility was referred to as the DUCC. Shortly after these secret plans began circulating at the highest levels of the JFK administration, he was assassinated in Dallas. I have no idea what his position was on the matter, but the plans continued to circulate at the highest levels of the government in the early weeks and months of the Lyndon B. Johnson administration. Everything that I have seen and heard points to the implementation of those plans, and on a large scale. In Hidden in Plain Sight I provide further documentation that goes to the updating and enlarging of the subterranean network beneath Washington, D.C. I used to live and work as a residential window cleaner in the Washington, D.C. area, but after a couple of years, I couldn't take it anymore. The negative atmosphere of the place was detrimental to my health, so I moved far away. Dr. Paul Craig Roberts has written repeatedly in recent weeks and months about the growing danger of a shooting nuclear war, likely initiated by dark, power mad factions within the USSA power structure. If you have read this far, you will have realized that I agree with his assessment. Nuclear war is a real possibility, and if the USSA continues on its power mad, imperialistic project of world hegemony, come hell or high water, then nuclear war is probably all but inevitable. Past a certain point, other nuclear armed nations will probably fight back. Those other powers would plausibly include, but not necessarily be limited to, Russia and China. There is profound wickedness in, and deep below, Washington, D.C. I mean that the place seethes with an odious, satanic atmosphere. Terrible evil has taken root there. It is perhaps the darkest center of evil-doing in the world, with the Vatican, Wall Street, the City of London and Tel Aviv-Herzliya following very hard on its heels. My research plainly shows that preparation for nuclear war is one of the major impetuses in the decades-long underground and underwater tunnel and base construction program. For example, the idea of putting nuclear missile silos in the seafloor popped up repeatedly in he materials that I consulted. My guess is that this has been done. The logical conclusion is that the USSA power structure has embarked on a massive, nuclear war preparation project. It is beyond insane. It is impossible to wrap your head around it. The implications are hideous beyond comprehension. And yet there is a lot of evidence pointing in that direction, some of which I have discussed in this article. In the early 1960s, the USSA military tried repeatedly to get President Kennedy to launch a first-strike nuclear attack against the USSR. Estimates for casualties were 140 million in the USSR and anywhere from 30 to 50 million in the USSA. The population today is far larger than it was half a century ago, so the casualties would undoubtedly be much higher. The very idea is insanity, by any measure. And yet, here we are, more than 50 years later, with the foreign policy of the USSA steadily driving the world towards a catastrophic war that could easily go nuclear. I am telling you, there are demons in human form in Washington, DC. There can be no winners from a nuclear war between the USSA/NATO/Israel on one side and Russia/China/Iran on the other. And so I need your assistance. I am asking for your aid. I know that some of you are more than able to assist me. For USA dollar contributions please e-mail me at: dr.samizdat1618@gmail.com and I will tell you how to send a donation.